Way back in 2013, I wrote a piece over at F This Movie about the importance of physical media and its lasting appeal. See, even back then, everyone was predicting the death of DVDs and Blu-rays, and video rental stores were dropping like flies. My writing of that column reflected a man trying to come to terms with the changing landscape of movie consumption. In the midst of a very obvious decline, old school items like VHS and vinyl were seeing a resurgence. Now, four years later, physical media is still holding on and we've witnessed an even bigger wave of nostalgia for things that are technically obsolete. Records are bigger than they've been in decades. VHS tapes are starting to be remembered fondly even by people who don't collect them, and the retro trend continues to grow in the mainstream. It all begs the question "WHY?" Why in the world is there a small, dedicated group of people who collect dated, obsolete technology? It would be so easy to write off everybody that's into this stuff as being hipsters, but that's just not true. Besides, in 2017, what is a hipster anymore, anyway? I've been called a hipster because I usually have a beard and a mustache and relate to old stuff. Can someone be a hipster if they're pursuing something with fervor and enthusiasm out of passion and love? At this point, I don't even know what constitutes a hipster, and I really don't care. The term feels like a relic of a time when we tried to classify people into narrow little categories. People don't fit into boxes. On the other hand, video tapes do. Considering Cereal At Midnight is basically founded on the notion that the zenith of modern pop culture has probably already happened (at least for this cycle) and that my second passion is history, OF COURSE this is a video-cassette-friendly zone. Not only my childhood but my adolescence and teenage years were built on stacks of tapes (both video and music), and those tapes played a HUGE role in the formation of my tastes. However, I am not blindly nostalgic, and intend to make the case that VHS appreciation goes beyond nostalgia and has a place in modern culture. One reason VHS collecting (and records, as well, but for the sake of this column, we're going to focus on video tapes) persists as a cult movement among movie fans, horror buffs, and genre nerds (three sub-groups that are often basically the same thing) is because video tapes are super cool. Despite their visual fidelity limitations, VHS was and still is simply a very cool way to watch a movie. These tapes hold a special place for those of us who grew up wandering the aisles of the video rental store like (Kevin Sorbo's) Hercules in the maze of the Minotaur; each shelf of each aisle was covered in boxes crammed together tightly, each with bold art that often had no bearing on the quality of the movie within. But it was through those blind wanderings and the seduction of incredible video cassette art that we discovered wonderful things and were taken to far away worlds. You would pick up the box, turn it over, read the back of the box, and marvel at the screen shots that stared back at you. This has been lost, and now we browse Netflix or Redbox to see what's new. Some of the art is appealing, but most of it is not, and the magic of the video store seems to have died forever. Or maybe that's just what we thought a few years ago. Shows like Stranger Things and movies like Beyond the Gates have continued to spread the word. Both of these were crafted by people who have an enduring love of genre films from the 1980s, and their affection for the experiences of their childhood is appealing to a generation who is completely disconnected from the tangible experience. Your humble author is a dad who has been fascinated by watching his own kid struggle with the lack of a physical connection with modern entertainment, and has seen the impact that the nostalgia in pop culture has had. When Starlord of Guardians of the Galaxy values his Walkman and mix tapes more than anything else (granted, he has personal reason to do so), that's MY generation showing a younger generation how connections matter. The 15-and-under set are so interested in shows like Stranger Things because it replicates that sense of mystery and excitement that we thought was lost. 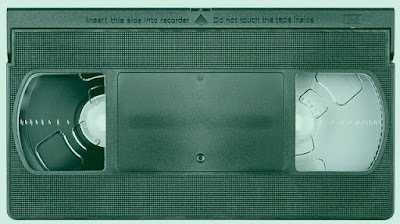 The world of video tapes was one that was a little creepy, a little mysterious, and a little exciting. How can you see box art of Spielberg's suburban fairy tales, or the post-apocalyptic wastelands of Mad Max, or the gory-yet-appealing campground killing fields of Jason Voorhees and not be pushed outside of your comfort zone in the best way possible? There was an electricity to that experience that was lost, but is slowly being rediscovered. It's not just about using the visual language of the past, but understanding what was so appealing about those stories in the first place. VHS is a physical representation of an age of magic. If the current movie marketplace is the Dark Ages that some cinephiles suggest, then VHS represents the pinnacle of Rome. All around us lies the ruins of a civilization that came and succeeded, and then disappeared. We can see their achievements, but we can't seem to replicate them. A lot of consumers could not care less about this physical connection. I recently witnessed an exchange in which a movie fan mentioned that they were skipping the early digital release of a film that was about to come out on Blu-ray because they wanted to wait for the physical object. This stance was met with genuine confusion over why anyone would rather wait for a DISC when they could have a digital copy now. It seems to me that the vast majority of media consumers today fall into the category of the guy who couldn't understand buying something as archaic as a shiny disc when you could have it digitally without it taking up any space in your home. For better or for worse, the majority of media consumption is currently dictated by the trends and deals within the industry. We can only stream the shows and movies that are available to us, and that availability can (and does) change often. Most people seem to be okay with this stilted method of "curated" (a word that I despise because it essentially means "controlled") entertainment, but it seems like more and more people have had enough. I suppose that makes physical media collectors a subculture, and VHS is a subculture WITHIN that subculture. If that's true, then I'm proud to be a part of that tiny fanbase. Here's a fact: the quality of most VHS tapes is better than you remember. While not up to the level of DVD clarity, a well-cared for movie on video cassette is still perfectly watchable and is miles from the bad tracking and washed out color that YouTube VHS spoofs would have you believe represents every tape. I spent years of my movie-collecting life trying to upgrade to the best possible quality of a given title. I replaced VHS with DVD, then DVD with Blu-ray. When a Blu-ray I already owned was remastered, I would usually upgrade to that (I think I've bought Army of Darkness 67 times). Now we have 4K, and who knows what lies beyond. Guess what? 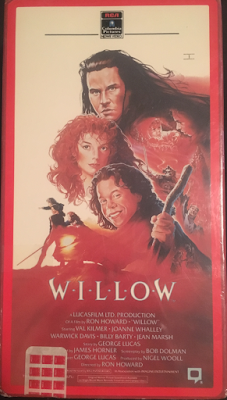 When I want to watch the original Star Wars trilogy, my preferred versions are the widescreen THX editions that came out on video tape in 1995. At what point do we individually tap out when it comes to re-buying our favorites every time an upgrade is released? Make no mistake: that point exists for every collector. When it comes to horror movies, there are scores of titles that have yet to see a release on DVD, much less Blu-ray. While boutique labels like Code Red DVD, Scorpion Releasing--even mainstream companies like Scream (Shout) Factory, Kino Lorber, and Olive Films--are all plumbing the depths of obscure cinema and putting rare films back in the hands of collectors in pristine packages, there are literally tens of thousands of copies of these movies floating around on VHS, and most of them an be obtained for small change. There is no greater joy than wandering into a thrift store and coming out with a stack of Cannon movies, '80s horror, and weird genre stuff you've never heard of on VHS tapes that cost you a dollar or, more likely, much less. These tapes have value. They are not door stops or drink coasters. They are pieces of a cinematic past that casts a huge shadow over today's entertainment, holy relics for a passionate band of analog crusaders. For those of us who remember the simpler, more enchanting days of our youths when video tapes were our portals to imagination, but also for a generation of younger movie fans eager to establish connections with movie history, VHS tapes still matter. Vintage is desirable and highly collectible. It always has been, and it always will be. When something is vintage, it implies a history, a time and place, and a story. It gives context. This is why vintage clothes fetch tons of money on eBay, and why original pressings of great albums go for big bank. Quentin Tarantino has made an entire career out of vintage chic, funneling his love of pop culture past into everything he does. Therefore, it makes total sense that QT has a massive collection that includes video cassettes, and he still uses a VCR to record movies instead of using streaming services like Netflix. Is he wrong to do so? Is he archaic? One thing's for sure: he's building his personal archive and expanding his cinematic knowledge by doing so, and he's retaining the physical connection to his passions. It may not be the most beautiful presentation, but is presentation more important than building a base of knowledge? We must now acknowledge nostalgia and admit its influence among the vast majority of VHS collectors. I keep thinking that we can't get any more nostalgic as a society than we already are, but I keep being proven wrong. The reasons for this are clear: the world outside our window is populated by hate groups, violence in the streets, Nazis, terrorism, political and social unrest, economic hardship, and general unhappiness. Faith has been lost in our leaders, and even Hollywood has given up on new ideas in an attempt to serve us reheated versions of what we once enjoyed 20 or 30 years ago. Things are pretty bad, so it's easy to look back at the days of the 1980s and 1990s with nostalgia. Those eras were defined by economic boom, relative peace, and an explosion of pop culture the likes of which hadn't been seen since the mid-sixties. Industry was booming and the western world was in a state of growth. Those of us who lived through it feel lucky to have been there. Many who didn't wish that they had. The VHS era holds undeniable nostalgic appeal, but it is not ONLY nostalgia. We owe it more than that. It deserves more than that. Video tape collecting is not for everyone, nor should it be. It's a very niche way of viewing movies, and is admittedly not the highest quality way to do so. Streaming has its place, but it is the opinion of this writer that this place is one of discovery, not in archiving or collecting. While I prefer Blu-ray to DVD, I'll take anything if it means I get to add a movie to my physical library. That means you can still spy me haunting the video tape section of thrift stores and second-hand shops, eager to discover titles that I've never heard of or that seem to have slipped between the cracks. To my knowledge, the only way you can see the theatrical cuts of Michael Mann's Last of the Mohicans or Kevin Reynolds' Robin Hood: Prince of Thieves in North America is on VHS, as all subsequent DVD and Blu-ray versions feature altered, "director's cuts" or edits. Those Star Wars video tapes from 1995 were the last time we got to see the original trilogy without added CGI elements that altered to tone of the films. See? There's value. It seems like the current model of thought dictates that physical objects need to be swept away, providing us a cleaner, unhindered existence. This is the prevailing mentality, but it does not represent everyone. Four years after I first pontificated the nature of physical media, it seems clearer than ever before that there will always be physical media and that the number of people who crave connection to their entertainment is growing daily. I can't help but wonder if, in the future, anyone will care about 4K or HD, or if we'll all simply care about the movies themselves instead of the vessel or format that those movies inhabit. These are interesting times in which the future seems more aware than ever of the past, yet that future remains cloudy and uncertain. Still, it's encouraging to this history-loving writer that our pop culture legacy is alive and well, even if only in the hearts of an ever-growing, passionate few.